The number of treatments that you need depends on your specific condition and constitution, as well as how long you have had this problem. As a general rule, it is recommended that you have a series of 6 treatments. Some people choose to continue receiving acupuncture sessions after their condition improves, for maintenance and for the additional relaxation benefits received during the treatments. The first session is about 1.5 hours, which will provide Gurneet with the opportunity to get to know you and learn about your whole picture and develop a treatment plan accordingly. The follow-up visits are generally 30 minutes to 1 hour. Most patients feel that acupuncture does not hurt. Sometimes, you may feel a slight prick when the needle touches the skin, but the sensation of the prick should go away almost instantly. Of course, if you feel any discomfort during the treatment, you just need to let Gurneet know and she will readjust the needles. The needles are sterile and clean. The needles come in a sealed package that is opened in front of you. The needles are only used on you, then they are discarded and are never used again. 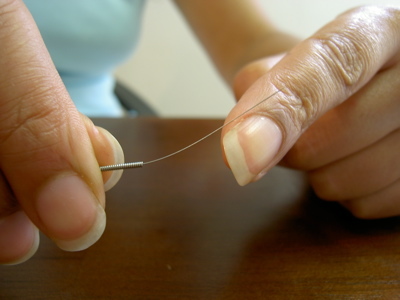 They are metallic and extremely thin and flexible, similar to the width of a strand of human hair! They are solid needles, so they are very different from the needles that are used to give you shots or to draw blood. Nothing is being injected into your body with the acupuncture needles. Patients generally feel extremely relaxed during the treatment. Many often fall asleep! People experience the sensation of the qi (energy) very differently. Sometimes people can feel energy circulating in their bodies, sometimes their limbs may feel heavier. At the acupuncture points, you may experience a deep pressure, an ache, or itching. This is all normal and it means that your body is responding to the acupuncture treatment. You should feel a lessening of pain, notice a decrease in presenting symptoms, and overall feel very relaxed. You don't need to do any type of special preparation. However, it is recommended that you avoid heavy meals, alcoholic beverages, and strenuous and prolonged physical activity both before and after your treatment.